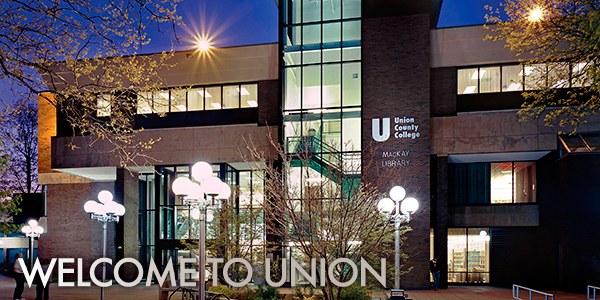 Union County College is a public comprehensive community college providing quality, affordable, accessible educational programs that serve the greater Union County region. It is the first of New Jersey’s 19 associate degree colleges and has been serving both career-minded and transfer-oriented students since 1933. The College operates major campuses in Cranford, Elizabeth, and Plainfield, and has satellite locations in Scotch Plains and Rahway. It enrolls almost 20,000 credit, non-credit, and continuing education students and is accredited by the Middle States Commission on Higher Education. Many programs lead to an Associate in Arts, Associate in Science or an Associate in Applied Science degree. The College also offers cooperative nursing programs with the Trinitas School of Nursing in Elizabeth, New Jersey, and JFK Medical Center Muhlenberg Harold B. and Dorothy A. Snyder Schools in Plainfield, New Jersey. Union County College has a remarkable history as New Jersey’s first community college. The College has lived three separate lives since its birth in 1933 as a one-room night school in a Union County high school. Over the past eight decades, the College that was known as Union County Junior College, Union Junior College, and Union College is now Union County College, a comprehensive community college serving 20,000 credit and non-credit students at three campuses in Union County, New Jersey. U.S. President Franklin D. Roosevelt founded Union County Junior College as an “emergency junior college” through the federal Works Project Administration. The College’s original mission was to provide jobs for unemployed teachers and professors. By 1936, the College became Union Junior College as an independent, non-profit, degree-offering institution governed by a Board of Trustees. The College’s mission was to prepare students for transfer to earn bachelor’s degrees. In 1982, the County-funded Union County Technical Institute merged with the 50-year-old junior college (named Union College) to form Union County College. The merger included the establishment of a Board of Trustees to oversee College operations, and a separate Board of Governors to act in an advisory capacity and to elect four of its members to serve on the Board of Trustees. With the merger of the Technical Institute and the existing junior college, Union County College adopted the multi-tiered mission of an open-access, comprehensive community college. As such, the College has over 60 associate degree and certificate programs, as well as noncredit opportunities for continuing education and workforce development. The College is committed to its “open door” mission as evidenced by its providing developmental education for academically underprepared students. Since fall 2014, the College has attracted the County’s brightest students to participate in its American Honors Program, a cohort-based degree program that provides honors students with seamless transfer to the nation’s top universities. Union County College has campuses in Cranford, Elizabeth, Plainfield, and an academic presence in Scotch Plains and Rahway. An increasing number of students are also taking classes online, as the College offers more than 150 classes through its distance-education program. More than half of the College’s students are enrolled on the Cranford Campus’ 47-acre suburban setting. The Elizabeth Campus is located in the heart of New Jersey’s fourth largest city, and more than 40 percent of the College’s students take at least one class in either the Lessner or Kellogg buildings in Elizabeth. The Plainfield Campus doubled its footprint in 2013 with the purchase of property that was once an automotive parts facility. In fall 2015, the Health Sciences building opened with state-of-the-art labs for the Practical Nursing, Emergency Health Science, and Paramedic Programs. The Cranford campus expanded in 2016, thanks to the Union County Improvement Authority. A two-story, 40,000 square-foot facility, an extension of the renovated historic Nomahegan Building, is now the hub of the campus. The Student Development Building houses a wide range of student services on the first floor in the Helen E. Chaney Student Services Center, named for the generous donor and alumna Helen Chaney, ‘48. The second floor houses classrooms as well as faculty and departmental offices. In August 2016, the Annex at the Plainfield campus finally re-opened after being shuttered for four years by a fire. The renovated building contains an Information Commons, bookstore, cafeteria, and has faculty offices on the second floor. In June 2017, the Middle States Commission on Higher Education reaffirmed Union’s accreditation after more than three years of hard work preparing for the visit and evaluation by the College’s faculty, staff, and administration. The Commission is a voluntary, non-governmental, membership association that defines, maintains, and promotes educational excellence across institutions with diverse missions, student populations, and resources. The most recent renovations were completed during the spring of 2018 to the first floor and lower level of the Lessner Building at the Elizabeth campus. The first floor houses a new Student Services Center and the lower level has offices and training classrooms for the College’s Center for Economic and Workforce Development. The addition of the new Student Services Center has allowed the College staff to provide modernized and streamlined services for our students and to continue with our mission of transforming our community…one student at a time! Union County College - Transforming Our Community… One Student at a Time. Our Mission is guided by our commitment to empower students to achieve their goals by providing access to high quality and affordable higher education to the residents of Union County. As a comprehensive community college with a diverse student population, we provide career programs, transfer programs, developmental education, and lifelong-learning opportunities, with a focus on excellence in all that we do. Union County College is committed to serving Union County in an environment dedicated to student success. The College has an open admission policy and is focused on educational excellence and the achievement of equity among the various populations served. The College strives to promote in students a sense of responsibility for their own development and an understanding of their obligations as members of a democratic society. The College fosters in students the desire to learn, the ability to think clearly and express themselves effectively, the habit of analytical and reflective thought, and an awareness of themselves, their heritage, other cultures, and their environment. Union County College, with its focus on student success, will be recognized as a national leader within the higher education community in providing quality education. Student Success - Helping every student to achieve success is our highest priority. We are committed to promoting a climate of student success and to providing an environment conducive to teaching and learning; creating and expanding educational opportunities and support services is paramount to our Mission. Excellence - We are committed to the highest standards of excellence in all we do; we exemplify this value by providing programs and services that ensure excellence in teaching and learning, student services, and organizational efficiency. Student Engagement - We are committed to enhancing and promoting student engagement by fully engaging our students as active learners and by providing a broad range of educational experiences both inside and outside the classroom. Collaboration - We are committed to productive exchanges with all members of the College community and collegial relationships among our various stakeholders. Integrity - We seek to uphold the highest standard of ethics. Stewardship - We value and honor the trust placed in us by making wise and efficient use of resources. Community Engagement - We are committed to encouraging civic engagement and supporting economic development in the region. Diversity - We are committed to a diverse environment that supports an equitable education for all of our students and emphasizes respect for various cultures and individual differences. Globalization - We seek to establish connections and relationships locally, nationally, and globally. In an effort to achieve the College’s Mission, we strive to fulfill the following goals and to assess them on a regular basis to ensure the quality of our programs and services. General Education - Provide a relevant and coherent general education for all students. Assess student learning outcomes in scientific/critical thinking and quantitative reasoning; oral and written communication; and information literacy/technological competency. Transfer Programs - Provide transfer programs for students planning to continue their education at a 4-year institution. Assess student learning outcomes at the course and program level. Regularly evaluate and update courses, curricula, and programs. Career Programs - Provide career programs to prepare students to enter the workforce and meet workforce needs. Assess student learning outcomes at the course and program level. Regularly evaluate and update courses, curricula, and programs. Developmental Education - Provide developmental education for underprepared students. Continue to implement approaches that facilitate the progress of students through the developmental sequence. Assess students’ success in college level courses. Lifelong Learning - Provide courses and programs that encourage lifelong learning and are responsive to the needs of business and industry. Evaluate and update courses and programs, in response to identified needs. Innovative Pedagogy - Develop, encourage, and support effective and creative approaches to teaching and learning. Regularly assess student learning outcomes. Student Support Services - Provide appropriate support services for all students that ensure success throughout the students’ college career. Evaluate and update key programs and services in response to student needs. Resources - Provide the necessary resources, both public and private, to support the institutional Mission. Also, continue to partner with the Union County College Foundation to identify and generate additional resources. Regularly assess the linkage between budgeting and planning. To reaffirm accreditation and to acknowledge the institution’s participation in the Collaborative Implementation Project. To commend the institution for the quality of the self-study process and report. The next evaluation visit is scheduled for 2025-2026. Union County College was granted the authority by the State of New Jersey in April 1982, to confer the degree of Associate in Arts, Associate in Science, and Associate in Applied Science and to award the certificate and the certificate of achievement. Union College, the precursor to Union County College has held the authority to confer the Associate in Arts degree since 1953, and the Associate in Science and Associate in Applied Science degree since 1969. Union County College is licensed by the State of New Jersey. Union College had been licensed since 1939. Diagnostic Medical Sonography - (Commission on Accreditation of Allied Health Education Programs with the recommendation of the Joint Review committee on Education in Diagnostic Medical Sonography), conducted jointly with JFK Medical Center Muhlenberg Harold B. and Dorothy A. Snyder Schools). These organizations are specialized accrediting agencies recognized by the U.S. Secretary of Education. Union County College is a public comprehensive community college. It is the oldest of New Jersey’s associate degree colleges, founded in 1933. The College operates major campuses in Cranford, Elizabeth, Plainfield, and Scotch Plains. Union enrolls almost 30,000 credit, non-credit, and continuing education students and is accredited by the Commission on Higher Education of the Middle States Association of Colleges and Schools. Union has had the largest non-credit enrollment among the nineteen New Jersey County Colleges. The Cranford Campus of Union County College is situated on 48 acres on the border between the suburban communities of Cranford and Westfield on Springfield Avenue, opposite Union County’s 200-acre Nomahegan Park. The campus is convenient to the Garden State Parkway, Routes 28, 27, and 1; is served by three bus routes of New Jersey Transit and is within a mile of the Cranford Station of New Jersey Transit’s Raritan Valley Railroad line. The campus has on-site parking sufficient for 1,497 vehicles. 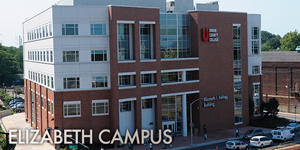 The Elizabeth Campus is situated on two sites, both within the major business district of Elizabeth, New Jersey. The first, in the Sidney F. Lessner Building, is located at 12 West Jersey Street, on a one-acre site a half block from the city’s major thoroughfare. The second, in the Elizabeth I. Kellogg Building, is located at 40 West Jersey Street on 1.4 acres approximately one block west of the Lessner Building. Both buildings on the Elizabeth Campus are within steps of the Elizabeth rail station of NJ Transit’s Northeast Corridor Railroad line, and are served by multiple bus routes serving Elizabeth, which is the county seat of Union County. The College leases 600 parking spaces under a long term arrangement with the city of Elizabeth in the J. Christian Bollwage garage, which is adjacent to the Lessner Building. 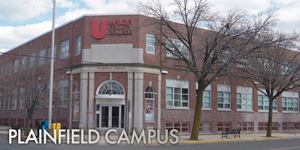 The Plainfield Campus is situated on two sites across from Roosevelt Avenue from each other. The first is located at 232 East Second Street on most of a city block between East Second and East Third Streets and Church Street and Roosevelt Avenue in Plainfield, New Jersey. It consists of three buildings and two parking lots that accommodate 189 vehicles. The second is located at 225 Roosevelt Avenue at the corner of Roosevelt and East Third Street. The Campus is convenient to Routes 22 and 28; is served by three bus routes, and is two blocks from the Plainfield Station of New Jersey Transit’s Raritan Valley Railroad Line. 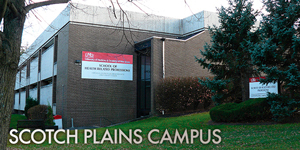 The Scotch Plains Campus is situated on 40 acres at 1776 Raritan Road, Scotch Plains, New Jersey. It consists of two buildings. The Campus is not served by any form of mass transportation but is convenient to Route 22 and major State routes. 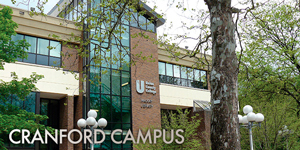 There are nine major buildings on the Cranford Campus at 1033 Springfield Ave, Cranford: Kenneth Campbell MacKay Library, Academic Learning Center, and the Center for Visual Arts and Communication; the Humanities, Science, and Nomahegan Buildings with classrooms, lecture halls, seminar rooms, science and computer laboratories, and faculty offices, lounges, cafeteria and faculty dining room; the NEW Student Development Building contains lecture and computer classrooms, faculty offices, and the Student Services Center offering One-Stop Registration, advising, and support services; the Campus Center with the Roy W. Smith theater, gymnasium, fitness center, Executive Education (teleconferencing) Center, other facilities for student activities, and bookstore; the Victor M. Richel Commons, a student life/student lounge facility featuring an atrium and multilevel floor providing a variety of lounge and meeting spaces; James R. MacDonald Hall, which contains administrative offices; and the William Miller Observatory, which houses a 24-inch reflector and 10-inch refractor telescopes, a lecture room, optical shop, and computer center. The Elizabeth Campus is housed in the seven-story Sidney F. Lessner Building at 12 West Jersey Street and the five-story Elizabeth I. Kellogg Building at 40 West Jersey Street, Elizabeth. The buildings, including their lower levels, provide classrooms, a theater, lecture halls, seminar and conference rooms, allied health, computer and science laboratories, Kellogg Library and Academic Learning Center, faculty and administrative offices, faculty and student lounges, dining room, bookstore and a Student Services Center and a Career Services Center. Trinitas School of Nursing is also located on Union’s Elizabeth Campus. The Plainfield Campus is comprised of almost a city block between East Second and East Third Streets and Church Street and Roosevelt Avenue. The three-story Lagos building contains classrooms, lecture hall, the Physical Therapy program, a state-of-the-art laboratory for American Sign Language and Deaf Studies, a student lounge, faculty and administrative offices, computing, testing facilities, seminar and conference rooms. The Annex building contains the Library, Academic Learning Center, offices, bookstore, and cafeteria. The Health Sciences Building across Roosevelt Avenue contains instructional space for Practical Nursing, Emergency Medical Technician/Paramedic Training, Allied Health labs, student lounge, and faculty offices. The College shares a 40-acre campus in Scotch Plains at 1776 Raritan Road, Scotch Plains with the Union County Vocational Technical Schools and the John H. Stamler Police Academy. Union County College operates a 65,000 sq. ft. building that provides classrooms, lecture hall, seminar and conference rooms, allied health and science laboratories, library, faculty and administrative offices, dining room and Campus Center. The purpose of the Union County College Alumni Association, a nonprofit organization, is to assist in advancing the mission of Union County College, to maintain a continuing relationship between alumni and the College and to strengthen the relationship between the College and the community. The Association hosts social, cultural and educational events and supports Union County College Foundation programs. Membership in the state-of-the-art Union County College Fitness Center at a reduced price of only $25 per semester. Free library privileges at all three campuses. For more information, call (908) 709-7505 or visit the Foundation House at 995 Springfield Ave., Cranford. The Union County College Foundation was founded by dedicated alumni and community leaders to raise funds to benefit the students at Union County College and to support innovative programs. With over 40 years of work to support student success, the Foundation is proud to report that over the past three years, the Foundation has provide over $3.25 million in scholarship support to our students. Thanks to the support of our community, the Foundation funds four student success campaigns that have a dramatic impact on student outcomes as well as a food insecurity program to help feed needy students. Inspire the Future aids students of Hispanic heritage by providing scholarship support to help them graduate on-time. The Food Insecurity Program provides free breakfasts and helps support the College’s food pantry. As a non-profit organization, the Foundation receives support from direct contributions, special events and legacy gifts. The Foundation staff manages the day-to-day operations of the organization, and an elected Board of Trustees oversees Foundation committees as well as administers the Foundation’s endowment. For more information on how you can support the Foundation’s mission, please call (908) 709-7505, e-mail foundation@ucc.edu or visit the Foundation’s website at https://www.ucc.edu/union-county-college-foundation/. The Foundation’s Annual Report is available upon request.